We wish you a very happy Thanksgiving and blessed beginning of a Christmas Season! We are thinking of you often at this time of year. We are adjusting to living in Estonia and learning to do our assignments. I (Külli) am teaching at the Baltic Methodist Theological Seminary and have started two courses: Introduction to Theology and the Thessalonian Letters. I am learning to know my students and their lives. Many of them travel to be at school and they are here one week out of a month. When they are here for their study sessions they have long days. Some come from rural Estonia, some from as far as Ukraine and Russia. We are thankful for their dedication and sacrifice. 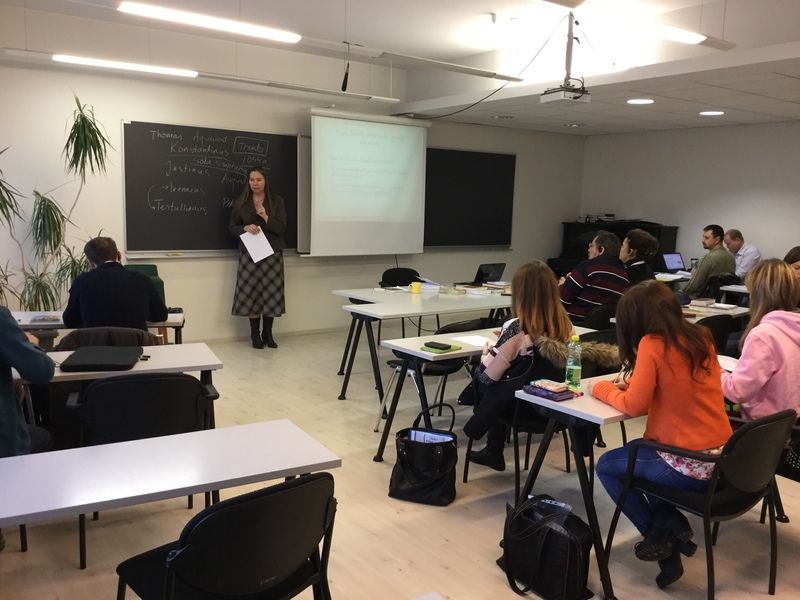 We teach in three languages: Estonian, Russian and English. I lecture in Estonian and translators translate simultaneously. So my work involves preparing all the materials in three languages. My Russian, that I learned in school, is being refreshed quickly. As students ask questions in Russian I usually understand about 50% of what they are saying. I can answer using basic phrases. Besides teaching, I have completed my book The Ending of the Canon, it will be printed by 2016. It is available online through Bloomsbury. I attended a few conferences lately. One at Tartu University discussed the latest polls on religious beliefs among Estonian people. It was very interesting. It is clear, that “being religious” or a “Christian believer” has decreased among Estonians lately, but it has grown among non-Estonians in Estonia. Also, the line between “believer” and “unbeliever” is really fuzzy here. Some believers subscribe to strange teaching like astrology and magic while nonbelievers may believe in God and prayer. What became really clear is that churches need to emphasize the content of Christianity and the Bible more. Also it is clear that there are still many who do not believe because they have not heard the gospel. But enough of myself. Douglas received his living permit and enrolled in Estonian language classes twice a week. He has a lot of homework for that. He practices his Estonian with people he comes in contact with. He knows just enough to be dangerous. Lately he reversed the meaning of two phrases “Tee ära!” (means “do it”) and “Ära tee!” (means “Do NOT do it!”). His reading is pretty good and he can now assist Karl with his homework! Doug has made a personal contact with many English-speaking people in the Tallinn congregation and is planning to start a fellowship with them in the new year. We are now making sure there is English translation available every week at Tallinn UMC. I know many of you are eager to hear how our kids are adjusting. Karl is going to the public school where there are 30 students in his class and one teacher. We wish they had smaller groups, but this year they had a record number of kids going to the first grade. Karl never complains and is diligent, but we think it is not easy. They provide him with some extra help with language during the afterschool program and his teacher speaks English. To give him a break, we also found him a really cool wood-working class and swimming lessons. He loves going to these. Kristofer and Kalev go to a kindergarten. Kristofer is in an Estonian group and Kalev is in a Russian group. We are really happy with both. One of Kristofer’s teachers regularly takes extra time to teach him language. He loves her and so do we. In the kindergarten they play outside with almost any kind of weather. We had to purchase them both engineered weather-proof outside gear. I had forgot this about Estonian weather. It does not get very cold in temperature here that often, but there is something about the moisture and wind from the Baltic Sea that makes the cold bite. Overall, we feel strongly that God has called us here to work and all family is adjusting culturally (that is including me). We are thankful to God who has seen us through an eventful year and shown us through it how faithful and loving He is. Many blessings to you all! We miss you as we think back to Christmas services at church and the holiday programs at school. We remember Thanksgivings with family and long drives home during this special season. May you all be blessed and kept in the love of our Lord Jesus Christ and may this time with family be special. As missionaries we have both the obligation and privilege to fundraise for Global Missions. There is one unique opportunity to make an online donation through the Global Ministries on the Giving Tuesday, December 1, 2015 between 12:00AM and 11:59PM CT and it will be matched by Global Ministries. Simply go to www.umcmission.org/give and search for Kulli Toniste #3022133 and Douglas Childress #3022134 among the MISSIONARIES. We are deeply grateful for your support. Külli Tõniste and Douglas Childress with family.